It should come as no surprise when I say that Mexican is one of my favorite cuisines. I mean, what’s not to love – chips, salsa, guac, cheese, rice, beans…enough said! I am ALWAYS down for some good Mexican food. I think one of the other reasons I love it so much is because the dishes are easier to replicate at home. There is an inherent simplicity that is great for the home cook. It’s so easy to swap out ingredients, adjust spices, etc. without totally ruining the dish. Please note that this does not mean that I make authentic Mexican. I make my own version of some of my favorite dishes. Let’s take the mushroom and onion quesadillas I made the other night. Talk about easy and delicious! The mushrooms added a nice meatiness, while the spices came together to create an almost smoky flavor. And the cheese…the sharp cheddar cheese, while not authentic queso, took it all to another level! Also, let’s talk about the cilantro garlic oil I made. For the past 30 years, I have been a cilantro hater. Aside from chutneys and a few other Indian dishes, I could not stand the stuff. I am still not a cilantro lover, but let’s just say that I am slowly coming around to seeing its potential…like in the oil I made last night. But for now, the cilantro paste that Vishnu uses as a sandwich spread has been working fine in my food. I’m not quite ready to graduate to the real stuff. Anyways, make these quesadillas ASAP. It’s the perfect weeknight meal that comes together in a short period of time. And be sure to make the oil as well. It infuses a lot of flavor into the dish and is honestly finger licking good! 1. Heat a skillet to medium heat and add oil. 2. Add the mushrooms, onion, and garlic and cook for 5 minutes or until the veggies are tender and just starting to get soft. 3. OPTIONAL STEP – add the quinoa/rice and stir everything together until combined for another 2-3 minutes. 4. Add spices (cumin through black pepper) and mix well. 6. Heat a separate pan to medium heat. 7. Once the pan is warm, place one tortilla on the pan. 8. When you start to see a few air pockets forming, sprinkle ½ cup of cheese on the entire tortilla. 9. Once the cheese is starting to melt, add ½ cup of the mushroom mixture to one half of the tortilla. 10. Fold the tortilla in half and cook on both sides until light brown and crispy. 11. Repeat for the other 3 tortillas and ENJOY! Mix everything together in a small bowl, spoon over quesadillas, and enjoy! Note: We also enjoyed our quesadillas with a bit of salsa because in our house you can’t have Mexican food without salsa. That’s the rule! What’s your favorite Mexican dish? Any fun recipes to share (links are most welcome)? I am with you about Mexican- one of the yummiest and easiest cuisines to replicate. I am sure it would make a Mexican cringe but i tend to deem any dish containing cumin, salsa and avocado as being Mexican. 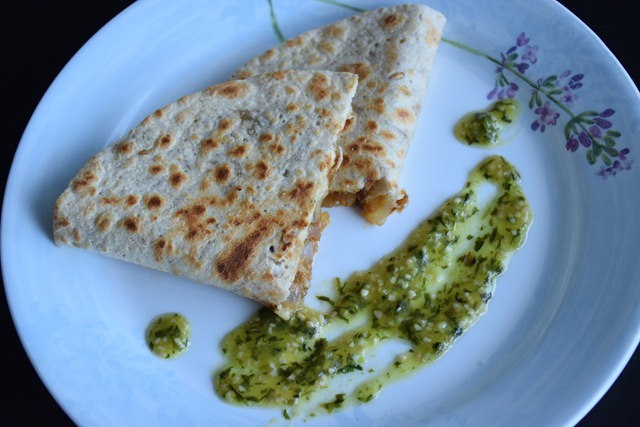 These quesadillas look delicious…right up my alley. You know I’m not a cilantro fan although the fact that you actually enjoyed the oil and sandwich spread gives me hope. Maybe I should start taking baby steps towards embracing this herb too! Mexican is one of my favorite cuisines too (aside from Indian of course haha). It is so easy to make, and I love how spicy the flavors are in so many of the dishes. I think this sounds like a great dish and that garlic oil you made could be used for all kinds of cuisine! Great idea 🙂 Thanks for sharing! 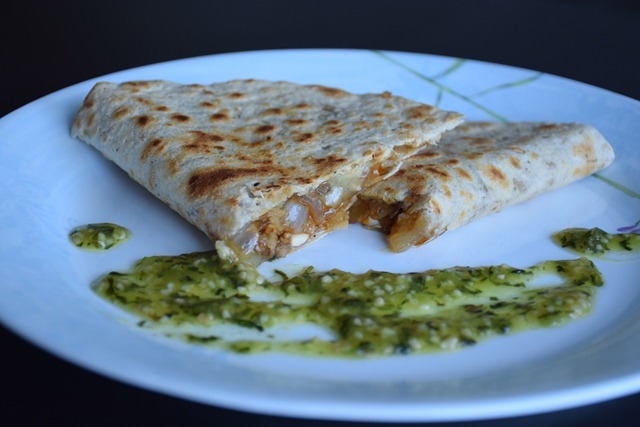 What an interesting twist on the ‘dilla! I must say, anything with avocado (and liberally used) and sour cream is defined as Mexican in my books! Arman @ thebigmansworld recently posted…Peanut butter loss and fig custard fail.